A group of Democratic senators last week urged Education Secretary Betsy DeVos to rescind a unilaterally implemented collective bargaining agreement with the nation’s largest federal employee union and return to the negotiating table, in light of a watchdog finding that the department’s actions broke federal labor laws. Sens. Patty Murray, D-Wash.; Kamala Harris, D-Calif.; and Elizabeth Warren, D-Mass., said in a letter that the department’s actions last spring to implement a “management edict” have weakened its ability to recruit and retain employees and have made it harder for officials to fulfill the agency's mission. “In attacking employees’ rights, the edict undermines your department’s mission to promote student achievement and preparation for global competitiveness by fostering educational excellence and ensuring equal access,” the senators wrote. In March, the Education Department cut off negotiations with the American Federation of Government Employees on a new collective bargaining agreement and implemented—without union input—a contract that gutted numerous employee perks and protections, including telework, alternative work schedules, official time and nearly two dozen categories of issues that had been subject to grievance procedures. In response, AFGE filed an unfair labor practice complaint against the department with the Federal Labor Relations Authority. Although that agency currently lacks a general counsel and cannot issue formal rulings by its board, it preliminarily found in July that the union’s case held merit. Federal labor advocates have claimed that the FLRA general counsel position has remained vacant as a strategy by the Trump administration to hamstring the agency from weighing in on federal labor-management disputes. Although AFGE leaders reported “preliminary conversations” with the Education Department after the labor authority's preliminary finding in July, there has been little formal progress. The senators, citing the preliminary FLRA finding, called the Education Department’s actions last spring a “violation of law” and demanded DeVos withdraw the March contract, particularly in light of an August court ruling by U.S. District Judge Ketanji Brown Jackson striking down a series of executive orders aimed at reducing the influence of unions at federal agencies. Although the Education Department’s actions predated the executive orders, the unilaterally implemented contract served as a prelude to those policies. The lawmakers asked the department provide information about what has been done to resolve outstanding unfair labor practice charges, as well as a tally of employees who have left the department since the implementation of the new contract. 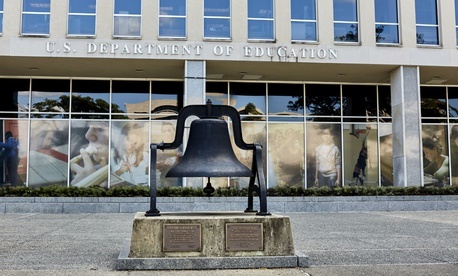 The Education Department did not respond to a request for comment Monday.